You can insert a chart into a spreadsheet. Select the range for which you want to insert a chart. Click Insert > Chart or click the Insert Chart icon on the toolbar. Tip: You can also right-click the data range and select Insert Chart. Select a chart type and then click OK. You can also double-click the chart type that you select. Optional: To preview how the chart looks with the data series in rows or in columns, click Data and then click the option you want. If you want to save the chart, you can right-click the chart and select Download as Image to save it in .png format. 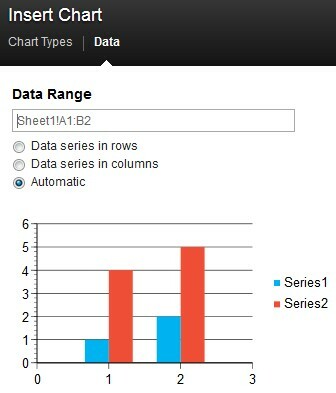 When files in other formats (.xls, .xlsx, and .ods) contain charts, the charts are retained in their supported types when you edit the file in IBM® Connections Docs. Likewise, when you create charts in Connections Docs and download the file to those formats, the charts are intact. You cannot group charts that you insert into a spreadsheet. When you import spreadsheets that already contain grouped charts, you must act on each object separately.